I’ve heard that the so called “monochromatic” look is in (Read more about it here from Vogue), but really? I believe this look is a little extreme for first ladies. I am all for the first ladies trying to follow in the famous fashion-forward footsteps of our beloved Jacqueline Kennedy, but Jackie never made a clown out of herself. Just last week, the First Lady of Cameroon, Chantal Biya, toured Stone Barnes Center for Food and Agriculture with Michelle Obama. The tour was an outing for several wives of those at the United Nations General Assembly in New York City. However, what on earth is she wearing? Yes, this style might look good on the runway, but in my opinion, it is way too bright and showy for a first lady. But then again, maybe she was just trying to imitate Mrs. Obama’s style. Just a few months earlier, Michelle Obama wore a similar suit as she spoke at the 90th anniversary of the Women’s Bureau at the Department of Labor in Washington, D.C. and highlighted (no pun intended) the progress made by women working outside the home. At this event, Mrs. Obama was dressed in head to toe papaya. 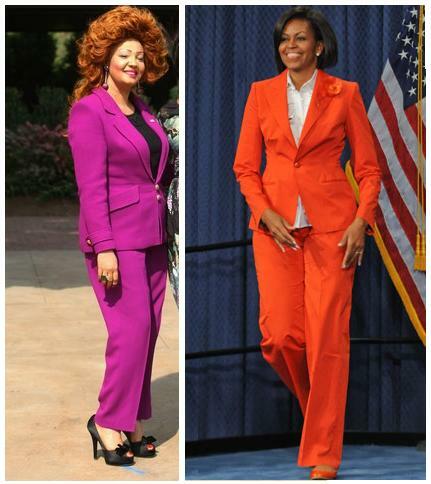 Now, Michelle has always been admired for her daring spirit and bold, colorful fashion choices, but orange? Michelle went above and definitely beyond the call of fashion by adding a matching papaya brooch, shoes and even papaya lipstick. I think bright colors are stylish, however, not in abundance. Who knows? Maybe these first ladies are setting a new trend that will catch on across the states. Or perhaps, they have made a great monochromatic mistake. What do you think? This entry was posted in Faux Pas?, Foreign First Ladies, Michelle Obama. Bookmark the permalink.